Tropical regions occur between the Tropic of Cancer at 23.5 degrees north and the Tropic of Capricorn at 23.5 degrees south of the equator. 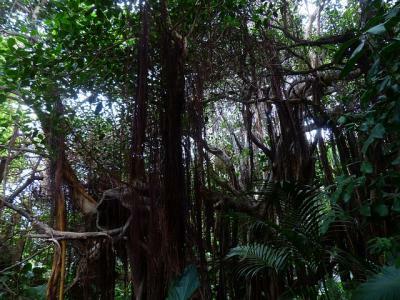 Tropical forests represent 31% of global ice-free land surface area, and harbor 50% of all known plant species; therefore there is a great deal of biodiversity within tropical forest regions. In the tropics the seasons are governed by precipitation, and the varying length of the wet and dry season determines forest types. In general, moist air that rises over the equatorial region cool and loses moisture as precipitation in tropical and subtropical areas. However, forest type can vary dramatically based on differing patterns of annual rainfall. One of the most well known tropical forest types is the tropical rainforest or ever-wet forest, which is evergreen and supports enormous biodiversity due to the consistent rainfall (at least 2,000 mm annually) it receives year-round. Tropical rainforests cover about 17 million square kilometers (12 % of Earth’s ice-free land cover), which is mostly in South America (Amazon basin), Central Africa (Congo basin), and Southeast Asia. Similarly, semi-evergreen forests also receive at least 2,000 mm of rainfall per year, but are more strongly seasonal, with a long dry season and intense wet season. The largest semi-evergreen forests are found in the Amazon basin and Congo basin. Tropical dry forests are dominated by deciduous trees, which are green during the rainy season, but lose their leaves during the dry season to cope with low water availability. These dry forests tend to be slightly farther away from the equator than the rainforests, and are less extensive, covering about 6 million square kilometers (4% of Earth’s ice-free land cover). Tropical savannas are even drier than dry forests due to a very long dry season, and are characterized by grasslands and the presence of a few scattered trees. The frequent fires of a tropical savanna landscape prevent the establishment of a tree-dominated dry forest, and promote the growth of grasses. Savannas are most extensive in Africa, but in total they occupy 20 million square kilometers (15% of Earth’s ice-free land cover). Mountainous environments in the tropics support montane tropical forests, which occur at elevations above 3,000 meters and can include tropical cloud forests. These forests are characterized by the frequent presence of mist and fog derived from orographic clouds. Montane and cloud forests are filled with vegetation that can take advantage of precipitation in the form of mist and fog, such as epiphytes that grow on other trees and collect airborne moisture without the help of a terrestrial root system. Montane and cloud forests are found around the tropical world, but are the least extensive in terms of total area compared to other tropical forest types. Land conversion, mainly to agriculture, is responsible for much of the deforestation and loss of biodiversity that is happening in tropical regions. Deforestation is a huge concern in the tropics because it contributes to global carbon emissions. Tropical forests store 40% of all terrestrial carbon, 58% of which is stored within the vegetation itself. Understanding how and where carbon is stored within tropical forests is critical to project changes in carbon emissions due to deforestation. Take a more in-depth look at the Amazon Basin and the Congo Basin to learn about the ecology and land use of these regions, as well as the issues concerning their governance and conservation. Ashton, M. S., Tyrrell, M. L., Spalding, D., & Gentry, B. (Eds.). (2012). Managing forest carbon in a changing climate. Springer Science & Business Media. Doumenge, C., Gilmour, D., Pérez, M. R., & Blockhus, J. (2012). 2. Tropical Montane Cloud Forests: Conservation Status and Management Issues. Ecological Studies, 110, 24. Elias, P., & Tobin, M. Tropical Forest Regions. In: Boucher, D., Elias, P., Lininger, K., May-Tobin, C., Roquemore, S., & Saxon, E. (2011). The root of the problem: What’s driving tropical deforestation today?. Union of Concerned Scientists. Mayaux, P., Holmgren, P., Achard, F., Eva, H., Stibig, H. J., & Branthomme, A. (2005). Tropical forest cover change in the 1990s and options for future monitoring. Philosophical Transactions of the Royal Society B: Biological Sciences, 360(1454), 373-384.